This colorful vegetable dish tastes great and is easy to super easy to prepare. 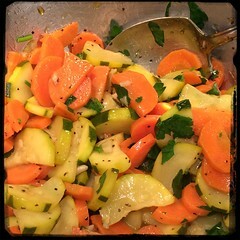 The sweetness of the carrots and zucchini provide a wonderful accompaniment for grilled meats. 2. On medium-high, Pre-heat 2 tbsp unsalted butter and 1 tbsp olive oil in a skillet. 3. Add vegetables and sauté until tender, mixing well.